Do You Know Your Ace-Point Game? From Backgammon Times, Volume 3, Number 3, Fall 1983. While the computer program that plays backgammon at world-class level has yet to be written, computers can be very valuable in analyzing end-game positions. One of the programs I have written analyzes the bearoff against an ace-point game. This program involves exact calculations rather than simulations. 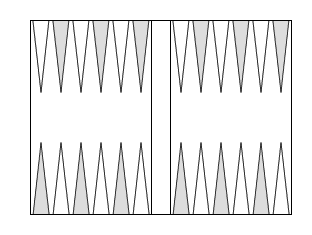 For each configuration of checkers, the exact probability of being hit at some point in the bearoff is calculated. This is done by starting with the simple positions and working backward to the more complex ones, so that every possible move from a complex position leads to a position already solved. The 2-point is "infinitely held"i.e., you will always have excess men on the 2-point if needed. If the 3 through 6 points are cleared, the position is considered 100% safe. The possibility of the opponent splitting off the ace-point at some time is not considered. All configurations of up to 12 men on the 3 through 6 points are analyzed. These conditions may cause slight inaccuracies, but the results should still indicate best play in most if not all positions. Here is a quiz involving some of these results. In each case, rate the four given choices from best to worst, and see how well you know your ace-point game. Assume that safety is the only consideration, and that the number of men borne off when a shot is left is irrelevant. In each case, I list the probability of being hit before clearing down to the two point for each play. These are not guessesthey are exact computer calculations. Observations: A gap next to the outer point is not bad at all. It is worth risking a double shot to clear points quickly. The point next to the outer point stripped with several men on the outer point is a very bad position. Observations: Having builders on interior points is very important, and definitely outweighs the need to keep even on the outside points. A huge stack of checkers on one point with the other points stripped is much inferior to a smooth position. Observations: Clearing the back point has highest priority, provided it can be done smoothly. A stripped position is quite dangerousa gap may well be safer. Observations: A gap two away from the outside point is much worse than a gap one away, and it is key to fill it. It is important to strip the back point so as to be able to clear it next roll. Observations: If the resulting position is relatively smooth, clear from the back and don't ask any questions. This has clear priority over any odd-even considerations.